Hi everyone! It's been quite a while but I'm still around and here's a great muffin recipe. I had bought quite a bit if cherries recently and didn't know what to do with them besides just snack on them all day. I came across this recipe in Good Housekeeping and I think they are great. 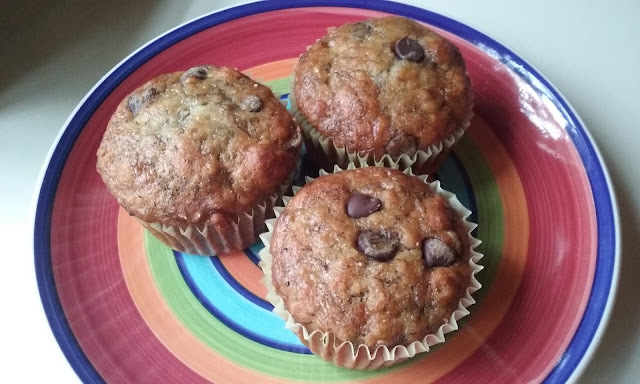 These are perfect for a snack and much better than any store bought or packaged muffin. Home baked goods to me are always the best!! Preheat over to 400 degrees F. Grease (or use paper muffin liners) twelve 2 1/2" x 1 1/4" muffin pan cups. In a large bowl, with wire whisk, stir flour, sugar, baking powder and salt. In a medium bowl, with fork, beat milk, melted butter, egg and almond extract until blended. Add liquid mixture to flour mixture; stir just until flour is moistened (batter will be lumpy). Add cherries and stir just until incorporated. Spoon batter into prepared muffin pan cups. Bake until toothpick inserted in center comes out clean, 20 to 25 minutes. Immediately remove muffins from pan and cool on wire rack. Makes 12. I don't know about you but I love a good cookie! I enjoy cake too...no doubt about that but there is just something about cookies! My favorite are Italian cookies that are found very easily up in the New York area. I miss a good Italian bakery. There are not many (if any) down here in Virginia. Cookies are a true weakness of mine along with a Starbucks cafe mocha! These cookies are definitely going on my list to make again and again. They are not only delicious but the easiest cookies I have ever made. They can be made in a food processor without waiting for the butter or cream cheese to soften. I had never made cookies this way before, let alone using cold butter! But it works. I found the original recipe here. Deb from Smitten Kitchen can always be counted on for providing a good solid recipe. I've had success with many of her recipes and this one is probably one of my favorites! These would also be great to have at Christmas time to add to your cookie tray. Just use red and green sprinkles!!! If you enjoy a good cookie please give this recipe a try. It's a winner! Heat oven to 375 degrees F. Line two baking sheets with parchment paper. Place flour, baking powder, baking soda and salt in the work bowl of your food processor and pulse a few times to blend. Add butter and cream cheese in large chunks, plus sugar and blend until mixture is powdery. Add egg, vanilla and almond extracts and run machine until the dough balls together. You'll probably need to scrape it down once or twice to get the mixture even. Scoop balls of dough with a 1 1/2 tablespoon scoop and roll them briefly in the palms of your hands before dropping them in the bowl of rainbow sprinkles and gently rolling to coat them evenly. 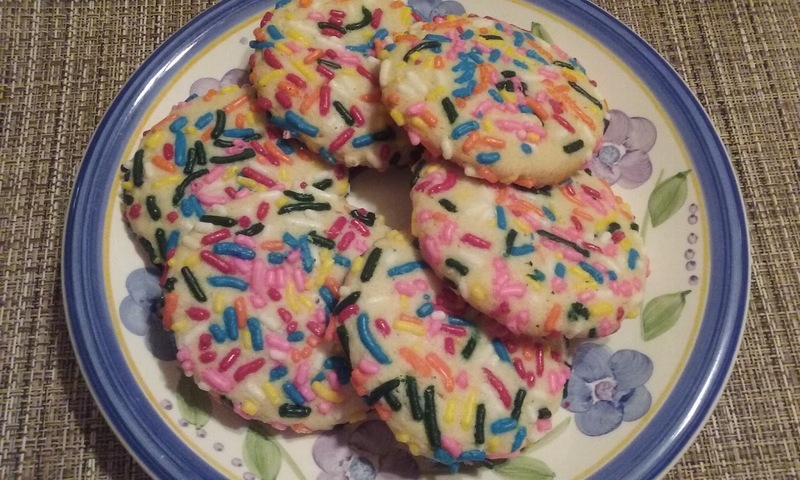 Transfer balls of sprinkle coated dough to baking sheets at least two inches apart. Use the bottom of a drinking glass to press down on the cookies until they are about 1/4 to 1/2 inch tall. If you see any bare spots you can gently press some sprinkles on that area. Bake for 9 to 10 minutes until they look underbaked but lightly golden underneath. Let set on baking sheet on rack for a few minutes before transferring to a cooling rack to cool completely. If you like a soft cookie stick with the 9 to 10 minute bake time. I prefer a crunchier cookie and had some bake for about an extra 3 minutes. That's just my preference. They taste great either way! Drain tofu for approximately 1/2 hour. I wrap tofu in paper towels and place on plate with cutting board on top of it and large round dish on top of that. Weird but it works. Change paper towels several times. While draining tofu, mince garlic. Chop up onion and place in round dish. Add 2 Tbs soy sauce, one Tbs sugar and 1 tsp mirin. Stir well. When "steaks" are drained, pat dry and dredge in flour. On medium high setting, add oil to cast iron skillet and saute garlic until fragrant, about 1 minute. 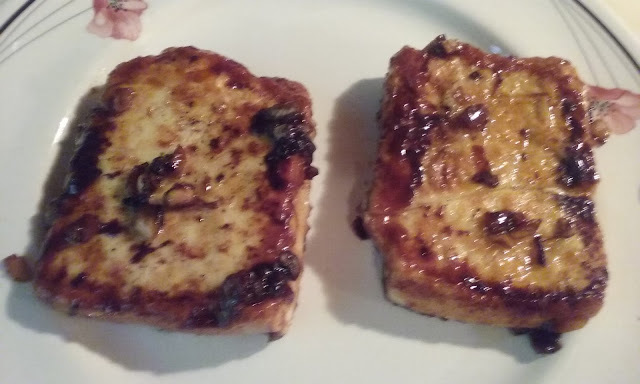 Add a little more oil and cook tofu steaks for about 5 minutes on one each side until browned. Add soy sauce mixture and cook about 2 minutes on each side until sauce cooks down and coats steaks well. This recipe was found on Facebook and the full recipe can be found on YouTube at TabiEats. If you're a fan of The Walking Dead you may remember several episodes back that Carol made a batch of cookies. Thank goodness - because what that means to me is that at least in the event of a zombie apocalypse there are still cookies! Yes, good ole cookies that you can make with ingredients that are in your cupboard and not in your fridge. This recipe has no dairy in it so the bonus is that it is also vegan! Are they good? Yes, they are delicious! 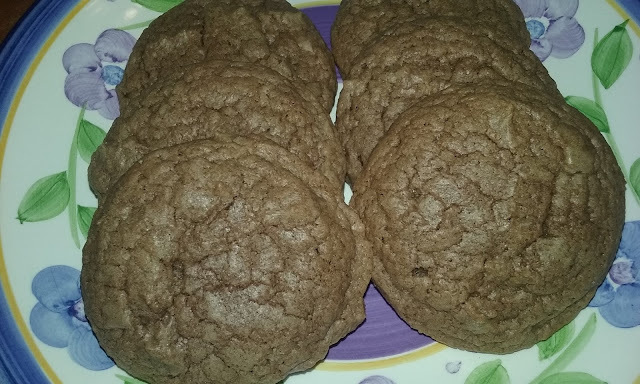 Carol made these cookies from what she had on hand but I'm sure you can add whatever you think would make them even better - chocolate chips, nuts or some additional spices. It's a good basic cookie that I will most definitely go to again and again and add something new each time. You can find this recipe at amc.com. Enjoy! In a large bowl combine shortening, applesauce, white and brown sugar and mix until all ingredients are blended together well. Add baking powder, baking soda, flour, salt and vanilla. Mix until doughy and flour is completely absorbed. Let dough stand 3 to 5 minutes. Add chocolate to dough and incorporate into mixture. Place golf ball size dollops of dough (I used ice cream spoon) and place on ungreased cookie sheet and space about 2 inches apart. Bake for 11-13 minutes and let cool on cookie sheet. 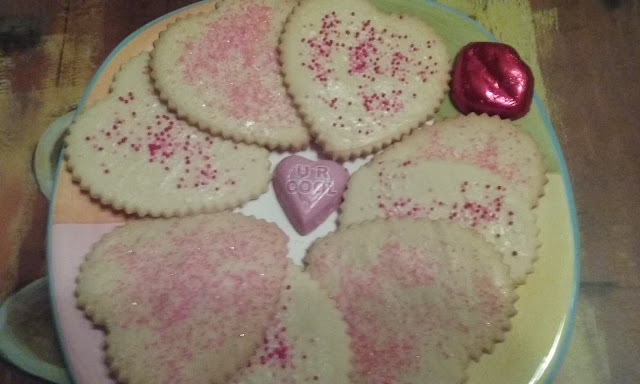 These cookies were made for Valentines Day. I had tried another recipe before settling on this one. The first recipe was such a disaster that the cookies and the cookbook BOTH went into the garbage. I wasn't taking any chances of trying anything from that cookbook again. How do some of these books get published?? You really have to wonder. After trying that new recipe I decided to go back to my favorite cookbook - The Doubleday Cookbook. This cookbook was originally published in 1975. Over 40 years ago. Doesn't matter...it's still my favorite and the one that I have gotten the most successful recipes from. It's like my baking bible! Never had a bad recipe come out of this book! These are called Sand Tarts but they are very much like a good basic sugar cookie and a wonderful dough to work with. I think you will like them if you try them. , one third at a time, beating just to blend. Wrap dough and chill 1 hour. Preheat oven to 375 degrees F. Roll a small amount of dough at a time to 1/8" thick and cut with a 2" round (or whatever shape desired) cookie cutter. Arrange 1" apart on greased baking sheets, brush with egg white and sprinkle with sugar or sprinkles. Bake 8 - 10 minute until pale golden. Cool on wire racks. Hope everyone has had a nice Christmas. The weather here has been wacky! Christmas Day was in the 70's and we even had the air conditioning on....I'm not complaining at all. This beats snow any day of the year! I've been trying more vegan recipes lately. 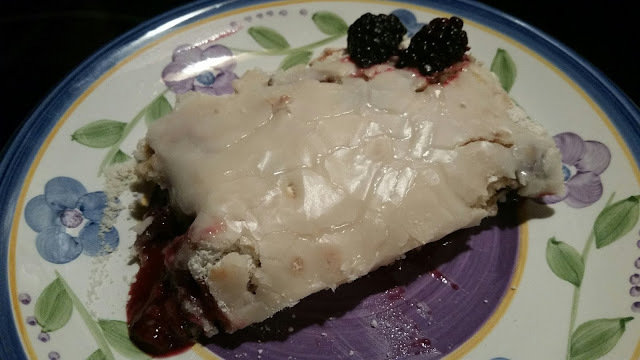 This one comes from the cookbook by Colleen Patrick-Goudreau, The Joy of Vegan Baking. So far both recipes I've tried have been a success so that is a good sign that these recipes work! 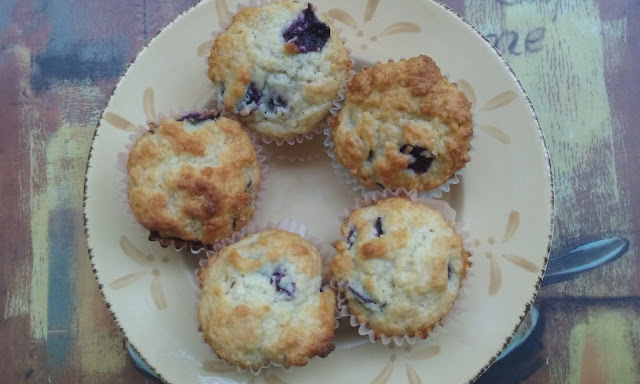 These muffins are flavorful and moist....so enjoy! Preheat oven to 350 degrees F. Lightly grease muffin tins or use muffin liners. In a medium size bowl, mix the flour, baking soda and salt together. In a large bowl, beat sugar and oil together, then add the mashed bananas. Stir in the water and vanilla and mix thoroughly. Add the flour mixture, along with the chocolate chips and stir to mix. Fill each muffin tin halfway with the batter. Bake for 20 to 30 minutes, until golden brown and a toothpick inserted into the center comes out clean. It's rare that I make a cobbler but when I saw this on Pinterest I knew that I would be making this one. It's so easy and delicious. It's definitely a winner. Frozen berries and a cake mix. Can it get any simpler? And the recipe works. I made some cookies the other night that were also real simple (too simple in fact) and they were a total disaster. I found the recipe in a cake magazine and the recipe was posted by the editor. Total failure, which my gut told me it would be. Nothing could save those babies...but this baby works!!! Please give this a try! And don't leave out the sugar coating. It is sooo good! 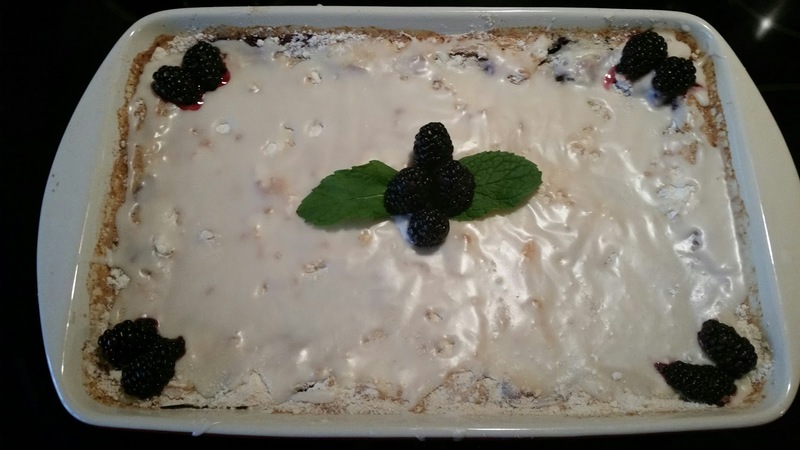 Place frozen fruit in 9 x 13 in baking dish. Add the dry cake mix over the top. Pour soda slowly over the cake mix. Do not stir the cake mix and the soda. This will give you a crust. If you stir the two you will have a cake like topping. Bake at 350 degrees F for 35 - 40 minutes. Slowly combine milk and powdered sugar to desired consistency. Add 1/2 tsp vanilla. Spread over warm cobbler and let set. Can be eaten while still slightly warm or cool. Welcome to Mocha Me! I started this blog over 9 years ago with your basic recipes and now will be adding vegan and vegetarian ones. Hope you enjoy your visit here and that there is a little something for everyone! Yummiest Food Recipes – Enjoy preparing yummiest food with easy recipes from Lidia’s cookbook!